The hottest bracelet style of the season! 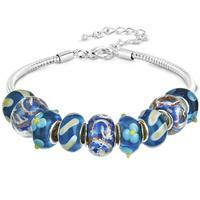 A beaded bracelet with stunning design infused glass beads. This blue shaded creation consists of an array of unique glass beads with alternating infused designs. The bracelet fits a 7-8 inch wrist size.The chain is adjustable to 9.5 inches. Beads can easily be added and replaced.